Well, I’m here to report it’s still hot. It’s still humid. And my hair still looks like an ungroomed Labradoodle. If I were a town crier, I would have nothing new to report. Sad really, because I love to talk. I also love to cook. And on these hot days, it doesn’t bother me to turn on the oven and bake – but Padme and Lando Calrissian get strangely bothered by the oven being on when it’s 96 degrees outside. Never mind that our house is kept at a freezing cold 75 degrees all day and night – sheesh. I think it’s all in their head……..don’t tell them I said that. They don’t read my blog anyways. Like I said, I love to talk. They know everything I do anyways. Where was I? Right, it’s still hot here. 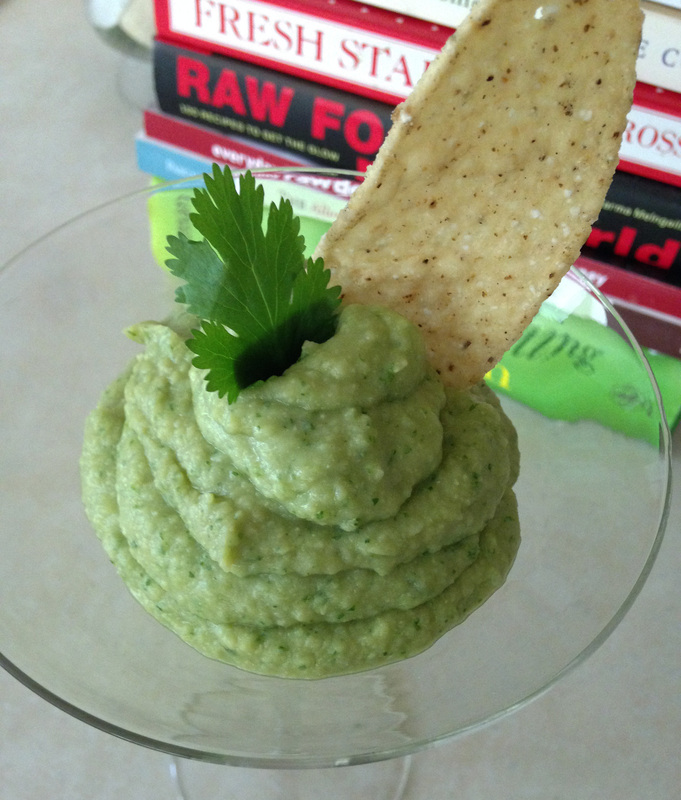 Yesterday’s entry to Bite Back Week was White Bean and Basil Dip. Easy enough, and chilled, it is divine! And there is enough oomph to it for it to be a small meal with some chips or pita bread to go along. Looking in my pantry for something not requiring the oven to be turned on I found garbanzo beans. And since I had been to our local fruit and vegetable store recently I had a ton of cilantro in the frig. I also had a bag of Trader Joes Organic Surfboard Tortilla Chips. And there you have it. 1 large or two small bunches of cilantro – pick the ones that smell the strongest, it’s a lovely smell! 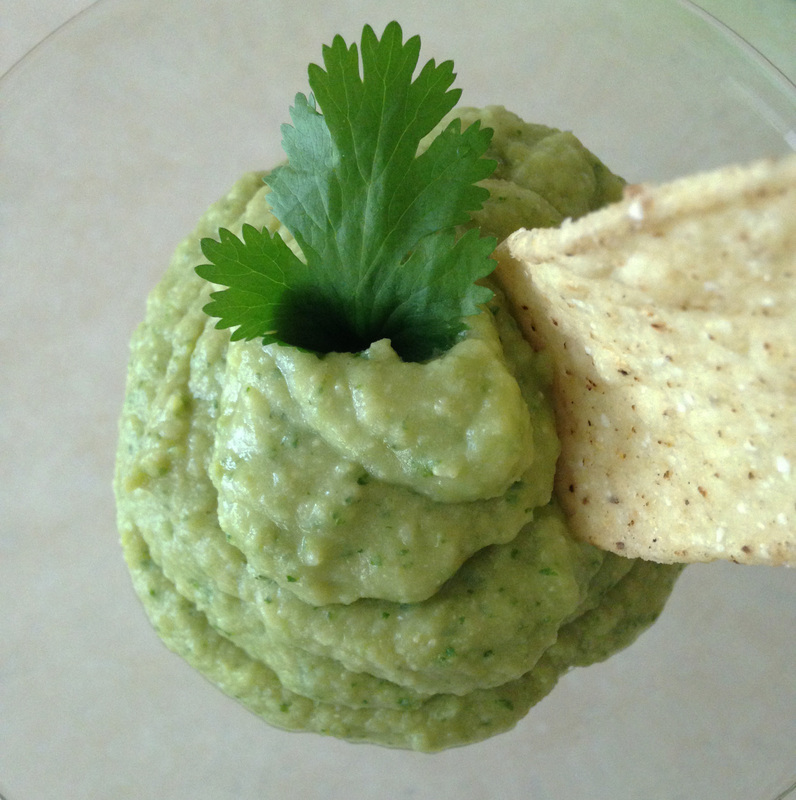 Now hold onto your chips – here’s how to make it…..
1. Wash the cilantro and remove the main stem, but don’t worry about the little vine/branches/whatever they are called that hold the leaves. Your food processor is going to take care of those. Or if you have herb scissors, you can use those. 2. Drain the garbanzo beans and put them into the food processor or large bowl. Add the cilantro, the garlic and the olive oil. 4. Enjoy! Seriously, no oven required.